GLASGOW, Scotland -- The five medals Simone Biles spent the better part of a week so easily collecting at the world gymnastics championships will join the nine others she's captured in a safe somewhere back in Texas. Maybe one day she'll take them out and admire her unprecedented success. Not anytime soon though. For now, there is only a brief but well-deserved break. Then it's on to that distant speck on the horizon that isn't much of a speck anymore. The Olympics loom nine months away. Barring injury, Biles will head to Rio de Janeiro as an overwhelming favorite and the pressure that comes with it. Yet if there's anything she's proven to herself during her run at the top, it's nothing she can't handle. "I think I've done a pretty good job at masking it over the years," Biles said on Sunday after adding two more gold medals to her rapidly expanding pile. Exhausted from a relentless training regimen, Biles nonetheless did what she always does when the lights are on and there's hardware to be had, soaring to gold in the balance beam and floor exercise finals on Sunday to cap a record-setting haul. 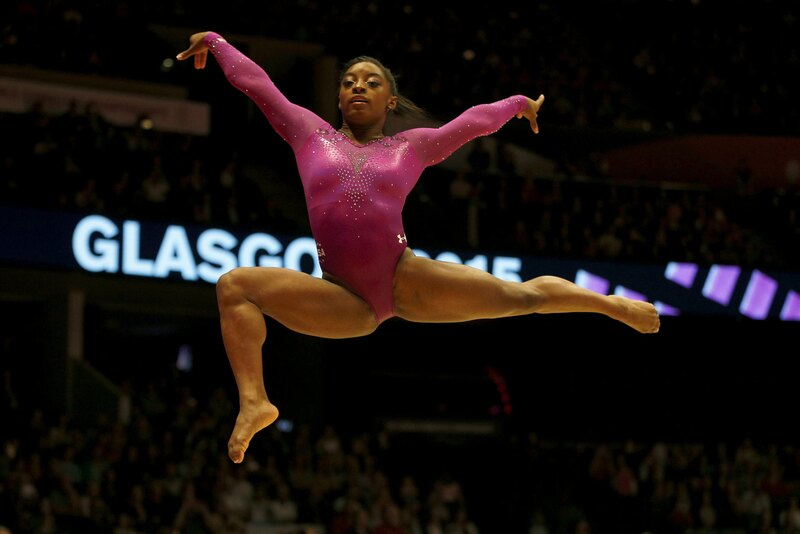 Biles leaves Scotland with four golds (team, all-around, floor and beam) to go with a bronze on vault. Her 14 world championship medals are the most ever by an American woman, and her 10 golds are the most by a female gymnast. "I don't think it's sunk in yet," Biles said. "But I know what I've achieved and what I've achieved is like, pretty unbelievable." While Biles knows her mark -- whatever it is when she's finally done -- will one day be caught, it may take awhile. Quite awhile. She had a hand in five of the eight medals the U.S. women won during a meet that did nothing to diminish expectations for another massive haul in Brazil next summer. The U.S. won at least one medal in each event. Reigning Olympic champion Gabby Douglas took silver in the all-around behind Biles, with Madison Kocian sharing gold on uneven bars and Maggie Nichols earning bronze on floor behind her best friend. It's a remarkable total and yet it won't matter when they get back to work in a week or so. National team coordinator Martha Karolyi said she reminds the women that it was a "fantastic performance but don't forget how we got here. That should be our motto for this next year leading up to the Olympic Games. Yes, we did a good job at worlds but that doesn't mean anything when it comes down to the Olympics." Biles joked she was thinking about leading the U.S. women's team on strike last week, visibly drained by a stretch of nearly a month without so much as a full day off. Karolyi defended the practice. The results make it hard to argue. Though Biles looked ready for a nap when she was introduced before the beam finals, she went out and put on a show anyway. Her routine was a steady mix of rock-solid tumbling and elegant choreography. While the majority of the eight-woman final struggled on the four-inch wide plank, she was near perfect. Her 15.358 was more than a full point better than silver medalist Sanne Wevers of the Netherlands. An hour later Biles was at it again. Floor is her favorite event, a 90-second showcase of the athleticism that makes her the LeBron James of her sport. She bounds so high during her boundary pushing tumbling passes she's probably got time to take a selfie. Her 15.8 was a full seven-tenths better than Russia's Ksenia Afanaseva and Nichols, who grabbed bronze to complete a breakout 10 days in which she showed Karolyi she can handle whatever is thrown her way. The U.S. men's program finished off a blue-collar performance at the championships with a needed influx of bling. They competed without injured standout Sam Mikulak, John Orozco and Jake Dalton. Faced with the prospect of coming back with nothing to check at customs, Donnell Whittenburg flew to bronze in men's vault while Danell Leyva swooped to silver on parallel bars. The 21-year-old Whittenburg thunders off the horse with enough power to make the nearest tackling sled shiver. When he drilled his second vault, he flexed in relief. "We never want to come here empty handed," he said. "Definitely a little relief for the men's side to bring back some hardware." Men's all-around champion Kohei Uchimura of Japan added gold in the high bar final, topping Leyva and Cuban teenager Manrique Larduet. Finishing second behind Uchimura should provide the 2012 Olympic all-around bronze medalist with a boost following an uneven quadrennial. "We need moments like these," Leyva said. "Especially me. I know that I need moments like this." You Hao gave China gold in the parallel bars final, with Oleg Verniaiev of the Ukraine second and Oleg Stepko of Azerbaijan third. North Korea's Se Gwang Ri won his second straight gold in men's vault, edging Romania's Marian Dragulescu and Whittenburg.